A full sound insulation system designed to be used for pre-cast and solid concrete floors, offering a robust resilient under screed layer system. (Minimum concrete floor weight of 335kg/m3 required). The Acoustic Impacta Rubber solution is seriously tough, puncture proof and is heavy enough to be used in traditional ‘real’ building sites. If you want a Sound Insulation System that’ll last for years to come, Impacta Rubber is the perfect choice. Available in rolls of 5mm thick the Impacta Rubber can stretch slightly whilst rolled, therefore it is recommended to unroll and rest the material for a few hours before measuring, cutting and laying. The JCW Acoustic Impacta Rubber has been fully site tested for the new 2003 requirements and is fully compliant with RSD performance targets. It’s also completely accepted by NHBC for A.D.E compliance. 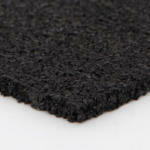 Additionally, Impacta Rubber is 100% recycled and recyclable, aiding in compliance with any environmental obligations.